The Cruise Ship Expo is a must for your travel to-do list. 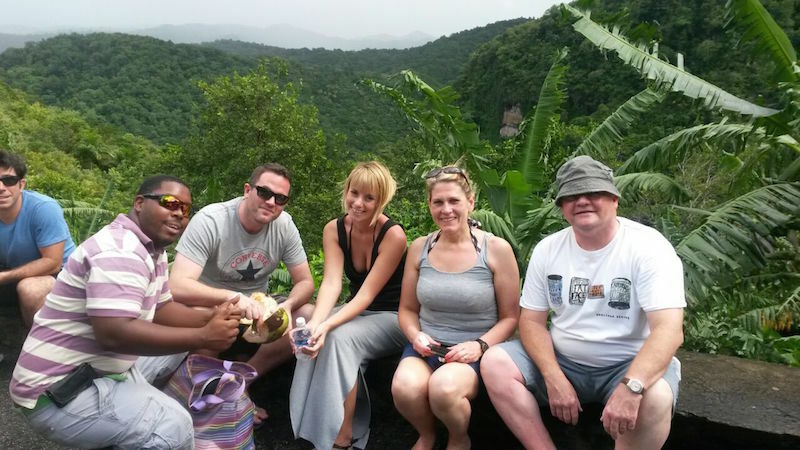 Booking with Real St. Lucia Tours ensures the best rates. A friendly guide will pick you up for the adventure of a lifetime. Book now! Taking a tour of St. Lucia is always exciting, but the Cruise Expo Tour is a notch above the rest. Designed specifically to give cruise passengers with only a short time on the island a taste of all that St. Lucia has to offer, this group-based tour is one of a kind. Your day starts at between 8:30 and 9 AM, when one of our courteous, local drivers will pick you up at the ship. You will find that your driver will be holding up a sign that bears the name Real St. Lucia Tours. The cool air-conditioning in the vehicle lets you enjoy all that this sun-soaked island has to offer in complete comfort. Once we are ready to depart, we will drive through Castries, the island's historic capital, where we will take in sights such as Derek Walcott Square and the famous 400 year old Massav Tree. We will also catch a glimpse of the Cathedral of Immaculate Conception, home to religious artwork created by St. Lucia's renowned Dunstan St. Omer. After a brief tour through Castries, this shore excursion in St. Lucia heads to Morne Fortune, where you will have a breathtaking view of the northern side of the island, including the harbor and a number of picturesque fishing communities. Providing a real sense of historical insight is the famed Government House, which features a Victorian design that will certainly make you glad you brought along a camera. From Morne Fortune, we will head on to the beautiful Marigo Bay, before heading on to the Roseau banana plantation, where the taste of native St. Lucian fruit will tantalize your taste buds in ways that will surprise you. Afterwards, we will head to Canaries and Anse La Raye, local fishing villages where St. Lucia delicacies will continue to delight. Here, you will also have the chance to buy some locally made crafts. Once you have tasted the delights of the island, it's off to Soufriere, the second largest city on the island. Here, we will check out a number of attractions, from the majestic Toraille Waterfall to Sulphur Springs, the only drive-in volcano in the world. Here, you will have the chance to take a dip in the relaxing and medicinal waters of the mud pools before a quick shower and an incredible last stop. Rounding out this thrilling St. Lucia shore excursion is a trip to either Jalousie Beach or Anse Chastanet. Here, you will have the chance to swim in the beautiful Caribbean waters or even go snorkeling while a view of the majestic Piton Mountains, a UNESCO World Heritage Site, surrounds you. These mountains are easily among St. Lucia's most recognizable landmarks, and they are so famous that our local beer is even known as Piton beer! As our adventure draws to a close, we head back to the north side of the island. Get back early enough to do some duty-free shopping at at your respective boarding area. The air-conditioned complex offers ample shopping opportunities and is within walking distance of Pointe Seraphine, another duty-free shopping area. Once you have had the opportunity to shop, it's time to head back to the ship and close out our adventure. The Cruise Ship Expo Tour is ideal for travelers seeking a shore excursion in St. Lucia that offers the chance to really get intimate with the island. If you want to make the most of your stop in St. Lucia and want to build memories that last a lifetime while shopping and tasting delicacies that will awaken your senses, contact Real St. Lucia Tours today! Customer service will respond within 15 minutes. Check your spam/junk folder if you haven't received a response. We have special rates for children (ages 11 and younger). All site entrance fees, refreshments, & eats are included in the price. Free pickup & Return from cruise ship/port. Free alcoholic and non alcoholic beverages & local rum punch.